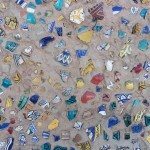 Rabat is truly a tale of two cities. The richer newer side where there are nice restaurants and beautifully decorated buildings to visit. The contrast being Sale where the old medina, markets and fort make you feel like you are stepping back in time. 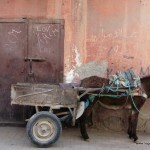 During our stay in Rabat we stayed in a self contained unit out in the suburbs at Es-Safaa Souk. It was the bottom floor of a family building with the parents living upstairs. It was pretty cool because we had cooking facilities, however if we didn’t feel like cooking we could always just run upstairs and knock on the door and Anima would cook something off the menu. Great cheap home cooked meals. 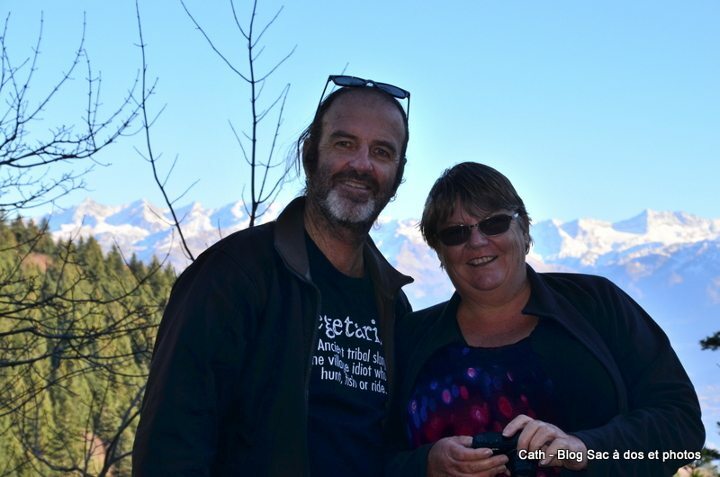 It also gave us an experience of living outside of the normal tourist strip which was a bit confronting but fun. Catching the bus into Rabat was good fun and it reminded us of being teenagers trying to squeeze as many friends into the back seat of a car as possible. The only difference of course was this was a bus and they were a whole heap of strangers. The bus conductor occupied a seat and reminded everyone to pay their fares by tapping coins on the handrail. Money was passed from one person to another from the front of the bus to the back. Then change and tickets were passed back from hand to hand. It was all very communal and surprisingly honest. 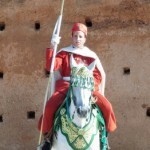 Rabat straddles a river with the older city of Sale on one side and Rabat on the higher side. It’s a mixture of old and new with beautiful new trams, fairly modern buses, 1970’s era Mercedes Benz taxi’s, donkey carts, push carts and horse drawn carts. 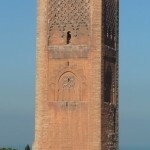 In Rabat we visited the mausoleum of Mohammed V and the Tower of Hassan. We were able to sneak into the gardens which are attached to the tower which are dissected by different water features. The Tower of Hassan and gardens are currently undergoing renovations so we were unable to see them in their best condition. 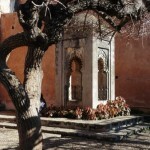 The Tower of Hassan boarders a large square with Mohamed V’s Mausoleum on the opposite side along with the Mosque. The square is filled with 336 stone pillars representing the lunar calendar. 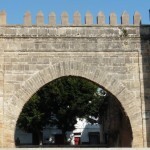 Along the edge of the square the old gates of the wall are protected by two mounted cavalrymen resplendent in red capes and fez’s sitting astride magnificent white Arab chargers. 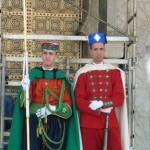 The entrance to Mohamed V’s mausoleum is guarded by red uniformed guards with rifles and inside there are green uniformed guards wielding lances. The mausoleum is covered in intricate designs from top to bottom. 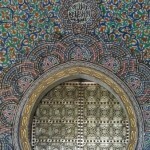 As Islamic art is forbidden to depict any living thing the work is all geometric designs and arabic script. It truly is a work of art. 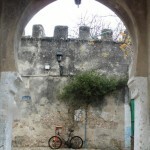 As expected there’s an old walled medina, and Kasbah which were quite interesting to walk through. On the beach below the Kasbah the beach was packed with boys playing soccer and out in the surf students from the various surf schools which fringe the beach. 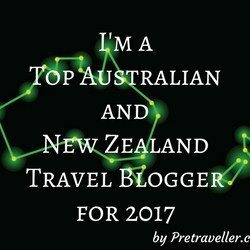 There’s also a few cafe’s and restaurants which overlook the beach with reasonable prices. Within the walls of the medina overlooking the river is the Musee De Oudaias and art museum within the palace of Moulay Ismail. 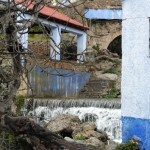 It also has a restaurant with views of the river and the Atlantic. Inside the palace gardens are a great place to take a break from the hustle and bustle. Back along the river there’s a number of cafe’s and restaurants which cater for people who don’t mind paying for the view and they’re filled with rich Moroccans and tourists . There’s even a restaurant in a converted dhow which looks pretty nice. Along the wharf area various venders sell snacks from popcorn to fairy floss and even local moroccan snacks. Tiny motorised cars for kids to enjoy are a bit of a favourite as are noisy push along toys with wheels and flappy wings. The wharf is a hive of activity with smaller rowing boats ferrying people across the river to Sale. Sale originally was the main city in the region but while Rabat has become the capital of Morocco Sale has become almost a suburb. 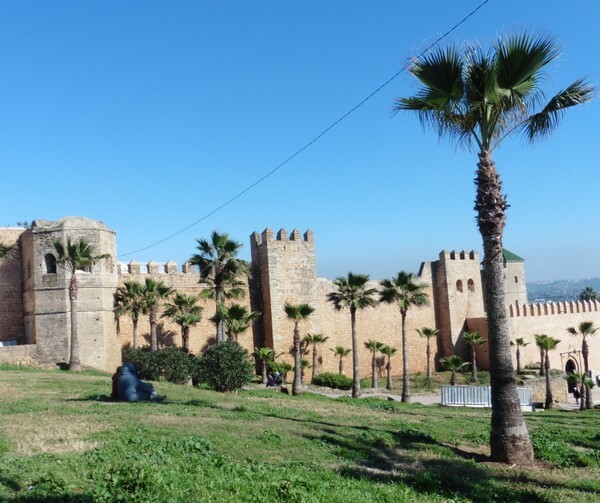 Sale has a large walled Kasbah, Medina and souk which run down to the Atlantic and along with Rabat’s defensive Kasbah protect the port. These days the port is home to a small fishing fleet and Sale is a great place to buy some lovely fresh seafood. 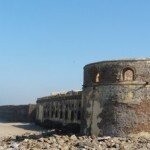 We took a walk along the beach to check out the old fortifications. 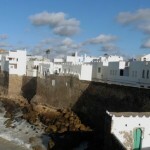 It was quite interesting as a wide expanse of sand separated the rocky coastline from the high walls of the Kasbah. After running the gauntlet of cafe stall holders on the way out to the beach we returned to sample some of the seafood. The stalls were quite busy with locals arriving for lunch which is always an encouraging sign. A mixed platter of fried fish for two was just the ticket for a beautiful sunny day and we sampled an assortment of sardines, salmontitos, ray wings, and other small fish deep fried in a light dusting of flour. During our stay we were able to witness a local market. One afternoon as we were arriving home we noticed a few vans parked up on the corner with the owners erecting rough looking marquees. 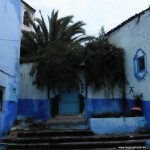 The next morning we awoke to the sounds of animals and the sound of an auctioneer spitfiring bids in arabic. Upon investigation we found the souk, behind the building on the southern side,was filled with all sorts of animals and hundreds of vehicles surrounding it. Overnight it had transformed from an abandoned set of buildings to a huge market. Meanwhile successful bidders were leading cattle, horses, and donkeys down the street to load into whatever vehicle they had. It was hilarious watching a group of men loading a young heifer into the back of a Mercedes panel van which was already occupied by six other men. Somehow a dozen or so of them and the heifer all fitted. At the end of the street, what we thought was the whole market was actually just a small section which was selling clothes. Further north all the vacant areas behind the buildings had now transformed into one of the largest markets we’d ever seen. All sorts of items were on sale including car parts, electronic goods, second hand clothes, boots, handbags, and lots of trash and treasure. There was also a hay market with trucks piled high with hay and drivers precariously climbing around the very tops of their loads to release single bales to load onto utilities, three wheeled pickups and donkey carts. It was quite reminiscent of days of old when traders brought their goods to town to the different markets and although some of the goods and transport systems had changed the markets hadn’t changed for hundreds of years. 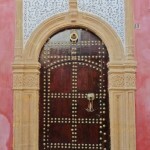 Overall we found Rabat to be a real melting pot of old and new and quite an interesting place to visit.